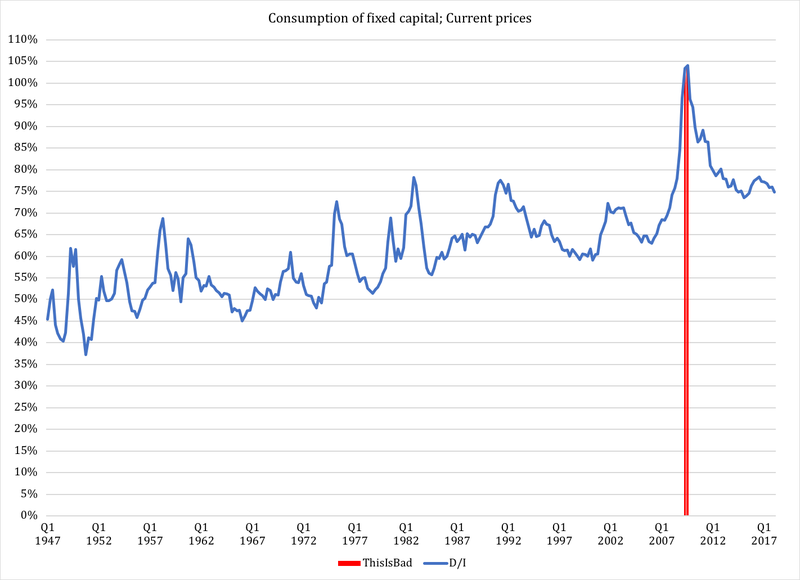 Larson's Political Economy: Is America's Capital Stock Bound for Decline? This is an important issue to look more closely at in light of the Trump administration's decision to collaborate with Congress on even bigger, even more irresponsible deficit spending. Not only does this mean we are at greater risk than ever before of a Greek-style fiscal crisis, but we have also built in lower economic growth by running a larger part of our economic activity through government. Traditionally, the economic drag created by government is illustrated in the form of stagnant economic growth. I have explained this in detail elsewhere; for now, let us note that it is pretty easy to correlate expansion of the welfare state with macroeconomic stagnation. What is less often noted is that the expansion of government can take a direct toll on private-sector investments. In theory, this seems obvious: savings equal investment, such that when savings are diverted toward government borrowing, less money is allocated to private credit needs. The so-called crowding out effect - familiar to anyone who has studied the IS-LM model in macroeconomics - means that government borrowing raises interest rates, thus making more private, credit-financed investment opportunities unaffordable. Starting from the bottom, government savings - in other words, the aggregate annual balance between all government spending and all government revenue - has steadily deteriorated over the years. Negative savings, of course, means borrowing money. Next up is GDP growth. As government finances have run deeper and deeper into the red - and that includes our state governments - the growth rate of our total economy has slowly but steadily declined. All the way into the 1980s we saw top growth rates of more than five percent; as recently as in the late 1990s we saw a sustained period of 4+ percent. With the exception of early 2004, four percent growth appears to be history. Even three percent growth is difficult to achieve these days; with the exception of a couple of quarters, during the Obama presidency our economy did not reach three percent growth. Every one of his eight years in office saw less than three percent annual growth. This growth problem is closely related to the expansion of government. It is exacerbated by the fact that government uses deficits as a permanent third-arm of funding (the other two being taxes and fees). In addition to what I explained in my books Industrial Poverty and The Rise of Big Government, our big welfare state slows down growth again because of the notably lower efficiencies in government operations compared to the private sector. A classic study showing just how fast government wastes money by growing, is a paper from 2003 by a group of economists at the European Central Bank. One of their most compelling conclusions is that a government twice the size of the U.S. government does not give anymore in output: the bigger government's output efficiency is half of that in the smaller government. The practical meaning of this is that there is an exponential loss of economic activity when government starts growing past a certain point. 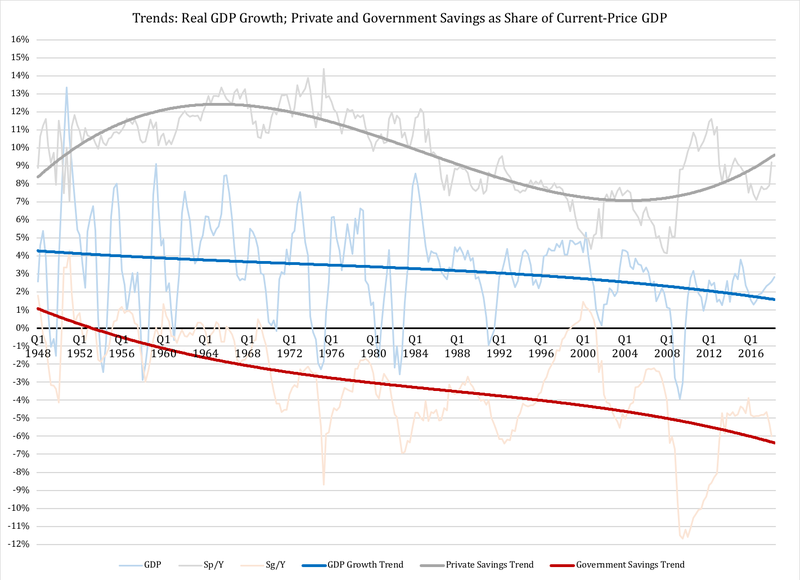 In my own research I have pointed to a permanent decline in economic growth when government exceeds 40 percent of GDP. It is reasonable to assume that this permanent decline is partly explained by an exponential rise in output inefficiency in government. As economic growth slows down, so does the need for productive capital. 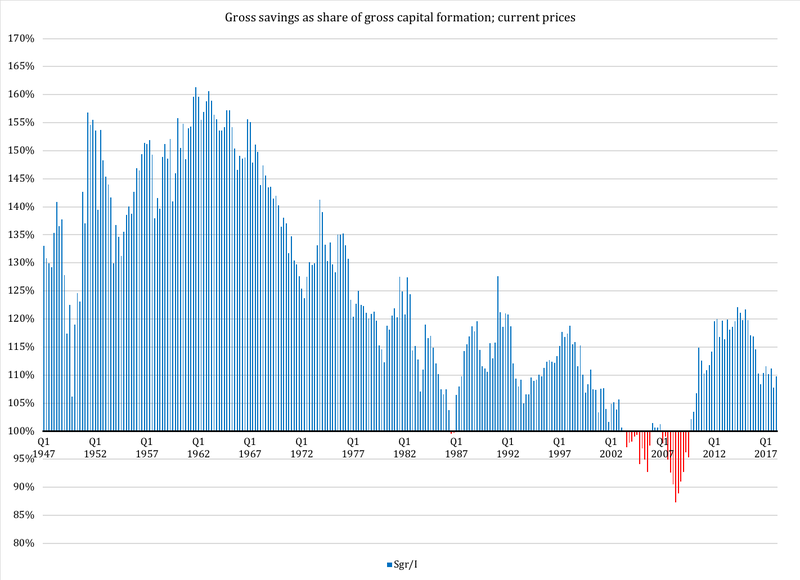 In recent decades, the United States has experienced a clearly visible relative decline in private savings as share of GDP. The grey function in Figure 1 explains how this decline began in the 1970s and has only seen a rebound in the past few years. When savings decline, it becomes harder for businesses to fund investments; our banking system, which matches savings with investment, operates increasingly close to the margins of the market. The blunt message in Figure 1 is that the more government borrows - on top of big spending - the more it is going to weigh down on the growth as well as the financial and economic resiliency of the private sector. For about 40 years after World War II, the U.S. economy could produce the gross savings that the economy needed for maintaining and expanding its capital stock. After some volatility toward the end of the 20th century (though with gross savings still exceeding gross capital formation) we saw a disturbing period where our savings were insufficient for the investments needed to form new capital and replace aging capital. It remains to be seen if the rebound in excess gross savings in the past few years is the beginning of a return to a healthy savings surplus. One of the key factors in making that happen is - yes - economic growth. Spending by households (the largest component of GDP) has been less than impressive in recent years, depriving America's businesses of important market growth. As a result, it has become less profitable to invest for the future. When the future is less promising, more of current investments are directed to the replacement of existing capital. It is usually less risky to replace existing capital than to form new: given that existing capital is already profitable, replacement investments come with a relatively safe calculation of return. An economy that grows, but grows more slowly, thus offers good opportunities for maintenance of capital but not so good opportunities for capital expansion. After having fluctuated around, or just above, 50 percent from World War II through the 1960s, consumption of fixed capital has been on a relatively steady upward trajectory. Going back to Figure 1, we can see how this trend correlates reasonably well with the slowdown in GDP growth that began in the 1970s. Again: businesses began focusing more on replacing profitable capital, increasingly shying away from the long-term risk exposure that comes with capital expansion. This trend is problematic in itself, but it also has troubling implications for the future. Right around when the Great Recession began in 2008, gross savings were smaller than capital formation (as shown in Figure 2). What is even worse is the fact that for two quarters in 2009 the U.S. economy spent more on replacing capital than it did on capital formation in total. What may seem arithmetically impossible is actually simply explained: the consumption of fixed capital is the write-down of the productive value of capital; the write-down of old capital can exceed spending on capital formation if we write off old capital faster than we replace it. For example, if a business has $1,000 worth of capital and writes off $100 per year, it must spend $100 per year on new capital in order to maintain its capital stock at $1,000. If investments fall to $90, the write-off - or, as it is called in national accounts, consumption - of old capital will exceed that amount by $10. The capital stock diminishes by $10, or one percent. When a nation's capital stock declines, it is in big trouble for the future. Its ability to satisfy its own needs is deteriorating. Since the period of negative investments was only six months long, we should not draw too big a conclusion from it. The change in corporate investments that appears to have happened following President Trump's tax reform could very well mean that this embarrassing episode in the American economy will go down in history as an anomaly. That said, to go back to our initial point about growth in government, as our government spending continues to grow, and we rely increasingly on deficits to pay for that spending, it is inevitable that we will repeat this episode of decline in our nation's capital stock. Irresponsible government spending has many structurally debilitating consequences. The stagnation trend in our economy is bound to continue until Congress gets its act together and actually begins reining in the welfare state. With continued economic stagnation, it is practically certain that the growth spurt following Trump's tax reform - which is strong but not as strong as some of his supporters suggest - will be a welcome but temporary deviation from this long-term trend. If, on top of this, we also begin to see recurring episodes of decline in our nation's capital stock, we are setting ourselves up for a very troubling future. Bluntly, we are giving our children a future of low-key misery, withering prosperity and entrenched industrial poverty.